After three days of hockey under a hot Italian sun England and LX came away with all four top trophies. England Grand Masters comfortably defeated Netherlands (4-1), Scotland (3-0) and Italy (4-0) before facing Germany in their final decider. John Land scored the only goal of the game and England Grand Masters retained the trophy that they had won at Rotterdam last year. 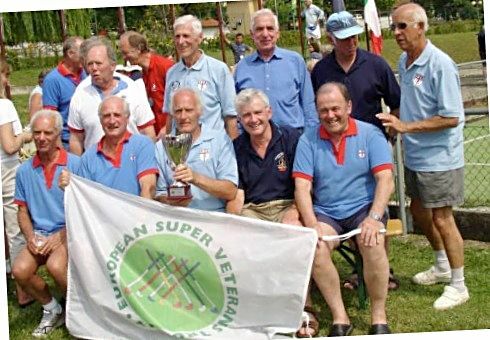 England Great Grand Masters also retained their European title with two decisive wins 2-0 wins over Germany and also a double victory over the Netherlands. In the secondary competition at Over 60 level for non-national teams LX started in some disarray and could only manage a draw against Scotland but then held on for a vital 1-0 win over Germany B and four more wins saw them home by one point from the Germans who had convincingly won all their other matches. To complete the full set, LX Over 65 took the Over 65 trophy after drawing with their rivals Alliance Over 65 (1-1) but finishing ahead on points thanks to a better record against the Over 60s teams in their Pool. England Grand Masters arrived in Bra determined to defend their European title, won at Rotterdam the previous year. Confidence amongst the 15-man squad was high, as they had not been beaten in any of their 'run-in' games, and the defence in particular had been looking very solid. The main pitch at Bra was waterbased, and there was a tired sandbased pitch also in use. England GM were lucky enough to have all their games on the water base, and to enjoy a draw which suited them, Netherlands late morning on Friday, then Scotland and Italy on Saturday, and the last game also late morning against Germany on Sunday. All games were a full 35 minutes each way. As all over Europe the weather was hot and this would make playing conditions hard for all, especially for those with two games in a day. A brief warm up and pitch familarisation on Thursday evening was followed by a light team supper, and everyone seemed 'up' for opening match the next day. England made a fantastic start to the tournament when thirty seconds into the game a through pass from Ken Wilcock was firmly deflected into the goal by centre-forward David Brampton. England settled into the game, having most of the possession and forcing short corners., the second of which saw Adrian Robertson feint to shoot and then slip right to Mike Surridge who hit the ball to the ’keeper’s left for goal number two. England continued to press. Peter Sharpe broke down the right crossing the ball square to Percy Steele who in turn slipped the ball to Mike Surridge and once again he shot firmly to the keeper’s left and the ball was deflected by the fullback for a third goal. When it seemed things couldn’t get any better, Peter Sharpe attacked the goal and passed back to the p-flick spot for John Land to sweep in for a 4-0 lead. Peter Ross and Rod Cochrane replaced John Land and David Brampton and at half time Terry Howlett replaced Mike Surridge in midfield. As is nearly always the case the second half saw the Dutch make real effort to turn the game and applied considerable pressure with England temporarily losing their shape. Some sloppy defence saw the Dutch convert a breakaway goal. This was the cue for England to wake up, put up the shutters and hold on to their excellent 4-1 lead. During this period a fine dribble by Peter Sharpe saw the goalkeeper make the best save of the game high and to his left. Unfortunately England’s euphoria was spoilt by a freak Achilles injury to Terry Howlett, but otherwise this was a superb result. England’s start could not have been better if scripted. Peter Sharpe picked up the ball on the right and went on one of his characteristic dazzling runs to the bye line and with pinpoint accuracy played the ball back to Ken Wilcock at the top of the circle. Without breaking stride Ken drove the ball into the roof of the net. Probably the goal of the tournament and less than five minutes into the match: a dream start indeed. Halfway through the first half we were two up following excellent work by Richard Clarke on the right. Richard fed John Land who had come across to the right bye line, and John’s first time cross was pushed in at close range by David Brampton. We continued to dominate for the rest of the half, playing very good hockey and using the left flank as well as the right. Our dominance was based on midfield control where Norman Ballard, Ken Wilcock and Mike Surridge effectively nullified Scotland’s playmakers so that the Scottish forwards saw little of the ball. By contrast England continued to create chances and with a number of short corners and even a penalty flick not converted, the 2 – 0 lead at half time ought to have been greater. The second half saw more of the same, and some 15 minutes after the interval the match was won. The move once again started on the right, with Richard Clarke, Norman Ballard and Peter Ross all involved in a quality build up which was finished by an impressive reverse sweep by Rod Cochrane into the corner of the net. The forwards always threatened while the back four provided total protection, leaving the keeper with little or nothing to do except keep up his usual dialogue with the defence. A very pleasing performance. With two wins behind them against Holland and Scotland, England could afford to be relaxed to be without Brain Perryman and Terry Howlett (both injured) for their game against the less experienced Italy side. However this relaxed attitude was not apparent and England failed to establish a fluid passing game into the attacking thirds of the field. England’s midfield dominance was regularly being thwarted by a determined nine-man Italian defence, and some fine saves by the Italian ’keeper as England moved towards and into the scoring circle. With half time approaching the deadlock was finally broken when David Brampton lifted a well struck pass from Ken Wilcock over the sliding Italian keeper; comfort for England with a 1-0 half time lead. The second period saw the consequence of the lead with England moving much more fluidly but still being rebuffed by the rearguard defence of Italy. With the majority of the England side in the attacking half of the field a breakaway pass to Italy’s skipper/centre forward brought great cheers from the Italian supporters, but the ball was quickly recovered and the assault continued. The patient retention of the ball finally resulted in three more goals for England in the last quarter of the game. One from Peter Ross, who collected a rebound from the ’keeper’s pads before flicking the ball home, followed the first from a direct short corner strike by Ken Wilcock. England’s dominance was highlighted with the final goal. A tame pass by John Land from the goal line back to Ken Wilcock was quickly transferred to Ken’s right to an attacking Adrian Robertson who struck the ball home from the head of the D. It was comforting to have this “difficult” game out of the way with a 4-0 win. The moment of truth! Three wins under their belt, only Germany stood between the English GM and an outright and emphatic European Cup defence! However the same was true for Germany, excepting they would be looking to wrest back the Cup from their traditional foe! So there was everything to play for. However Skipper Ken Wilcock's selection remained restricted - there were the usual and inevitable range of minor injuries, but Terry Howlett remained injured and out of the tournament, and Brian Perryman, who had rested himself for both matches the previous day, was still in pain. The starting line up retained the defence of the three earlier matches, a defence which had not conceded a short corner for two games, and only one goal in the last three! Alan Dures in goal, and from right to left, Clarke, Robertson, Crayford and Steele. The midfield too was unchanged, with Perryman returning to the right, skipper Ken Wilcock in the middle and Surridge on the left. Peter Sharpe (right) and John Land (left) took the wings and Brampton the central striker role. On the bench England had forwards Rod Cochrane and Peter Ross, along with midfielder Norman Ballard. After their early exit in Rotterdam, Germany had been in a rebuilding mode. More trials and more potential players from old East Germany resulted in a number of newer younger faces. However, the traditional German tactics remained unchanged. They kept two or three players up and high and eight or more behind the ball. Soaking up pressure, they would counter attack either by the long ball upfield or their defensive midfield suddenly breaking out of defence. They played neat if uncompromising hockey, and were experienced in maintaining possession in defence. In the early stages of the first half, England generally dominated, working the ball upfield well and creating dangerous opportunities. They looked overall the better and more fluid team. Germany however remained threatening in counterattack situations, and spectators had a number of nail-biting moments. After some 20 minutes, a well-worked move culminating in a cross from Peter Sharpe on the right wing saw a goalmouth melee in which John Land pushed the ball home. A vital goal had been scored, and one which would force the Germans to come forward to retrieve the arrears. Shortly after, England were indeed dispossesed in midfield after some overly casual play, and a fast break by Germany saw them all but score, Peter Crayford making a goal bound defensive intervention from out of nowhere! It was a nasty moment which woke up the team. The remainder of the first half was finely balanced, Germany playing with vigour and determination, England remaining calm and still building with possession, and starting to use its forward substitutes to inject fresh pace. England expected Germany to start the second half with energy and resolution, but curiously Germany looked as if they were running out of steam, and the GM defence became dominant with the English forwards still obtaining good chances. Late in the second half Peter Ross cleverly disposessed a German defender and in a one on one with the German goalkeeper had the chance to finish the match. However the one-time international ’keeper made the right dive, and a fine save, but even this, and the withdrawal through injury of Brian Perryman, failed to change the direction of the game, and the second half ran out with England increasingly in control, and the fresh legs of Norman Ballard helping keep the Germans on the back heel. Evidence of the GM control can be seen in the fact that for the third consecutive game, the English defence did not concede a short corner, and keeper Alan Dures was rarely tested. In a tight, well fought but good-natured game, England were the worthy winners, acknowledged as such by the Germans, and the Cup was retained in a decisive manner. All the team had played well and played their part, and the only cloud in the sky was sympathy felt for injured Terry Howlett, restricted to the touchline! First the beer tent, and later Leverkeusen, beckoned! With the 2006 tournament format requiring matches against the Dutch and the Germans on a ‘home and away’ basis, four tough games were in prospect if England were to retain the title that they won in Rotterdam last year. Intent on getting their campaign under way with a winning start, England opened the game quietly, passing the ball around to give the side time to get a feel of the pitch and some measure of the German opposition. With Leon Mack and David Birch sound at the back and German possession being restricted by David Wright and George Hazell in midfield, England began to exert pressure and the Germans were hard pressed to get out of their own half. With 20 minutes played England moved into a deserved lead when Germany failed to clear a loose ball in the circle and John Seear was on hand to direct a firm strike past the ’keeper. Following this reverse, the Germans raised the tempo but were unable to break down a resolute defence. Moving into the second half, the Germans were at last able to threaten and forced a couple of short corners, but the danger was cleared and England moved into a 2-0 lead when, from a short corner, a David Wright strike was steered into goal by Dominic Bann. With time running out, the Germans were unable to break the England defensive line and the final whistle came with England well on top. From the first whistle, it was clear that the Dutch were seeking to ensure that England were not able to establish the rhythm that developed in the previous game and close marking of the England attack and uncompromising defence meant that play was limited to the middle of the pitch. Once again the England defence was sound with Colin Pearce and Brian Tubb prominent. After 15 minutes England moved into the lead when Gerald Wilkinson advanced down the right and scored with a powerful cross shot. With the Dutch now forced to attack, the game opened up and both sides created opportunities. England had a great chance to double their advantage when they were awarded a penalty stroke but Bill Warrender’s flick struck a post and the half time break gave the Dutch defence much needed respite. The second period opened in similar style with England having the better of the exchanges and eventually getting the all important second goal, when the Dutch failed to clear a short corner and Bill Warrender was on hand to tuck the ball over the line. With the Dutch resistance finally broken England dominated the final stages but were unable to add to the score. Knowing that the Germans would be intent on revenge, it was important to get off to a solid start and England took the lead immediately when the Germans lost possession in their own ‘25’ and conceded a short corner. Unable to get in a shot, the ball was turned across goal by David Birch and Bill Warrender was on hand to convert. Stung by this setback, the Germans swarmed on to the attack, but again the English rearguard was equal to the task. With no option but to attack, the game opened up but England, prompted by Alan Jackson, always looked the more likely to score. Moving into the second period, the game became more open as the Germans moved forward and the England forwards again threatened. The second goal came when a cross from the right was deflected across to the far post and Andy Holden was on hand to collect and push home. With the German side now in some disarray, they were further handicapped when their captain was shown a yellow card. England added a further ‘goal’ through John Seear, and although the umpire awarded the ‘goal’, it was subsequently disallowed when the umpire from the other end of the field intervened!! With the clock running down, the Germans were relieved to hear the final whistle as the England attack maintained the pressure. With Mike Beaney at centre half, Colin Pearce on the right and Dominic Bann and Keith Hedley on the wings, England took to the field full of confidence for this final encounter against the Dutch. However, Holland were well up for the contest and from their first attack a well-struck shot gave Mike Fripp in goal no chance. Flushed with this early success, the Dutch swarmed into the England half and a firm ball into the circle took two deflections before finishing in the back of the net, with Mike Fripp unsighted. With only ten minutes of the match gone and two goals in arrears, England needed to re-group and hold their ground. This was done to good effect and the tide slowly turned more into England’s favour as half time approached and a string of short corners resulted, but without reward. Moving forward from the restart, England were steadily building up the momentum but unable to find the moves to unlock the Dutch defence. With 15 minutes remaining, the pressure finally told as Gerald Wilkinson strode into the circle and rifled an unstoppable drive into the far corner. With their tails up and the Dutch endeavouring to hold the advantage, they were undone for a second time when George Hazell fired inside the right hand post, direct from a short corner. With time running out and England desperate to protect their unbeaten record, the Dutch conceded a third goal when a direct strike from a short corner eluded the ’keeper and Dominic Bann was on hand to guide the ball into the net. This game was a stern test of the character of the England side and the end result should give confidence in the run-up to the World Cup in Germany in September. Squad: David Wright (capt); Mike Fripp; Mike Beaney; Gerald Wilkinson; David Birch; Leon Mack; John Seear; Alan Jackson; George Hazell; Keith Hedley; Brian Tubb; Andy Holden; Colin Pearce; Bill Warrender; Dominic Bann. Congratulations to every squad member on our victorious campaign, with particular thanks to Bob Purshouse for his administrative skills, Mike Gallant for being Transport Manager and for his local knowledge of the area, also to Tony Jones, our shy, softly spoken Treasurer. Our triumph was the more spectacular, considering the various injuries that we had to absorb – this seemed to make us more determined to work as a cohesive unit. Thanks to Adrian Stephenson for his immense efforts in knocking in a goal whenever it was most needed. Thank you Geoff Morley for coming into the squad late on, and a huge thank you to Graham and Lesley Martin who joined us the day before the tournament started. Nigel Dixon, in goal, did not have a lot to do except when we played Germany, when we scored in the first minute and thereafter had to dig deep to defend our lines. Nigel repelled everything that was thrown at him, especially so in the last few minutes of the game. Nigel certainly earned his Barolo for that performance. Every squad member contributed both on and off the pitch to make the tournament the success it was – great team spirit throughout. Finally a big ‘thank you’ to our ladies who supported us so well, as always with great enthusiasm and charm. Squad: Nigel Strofton (capt), Nigel Dixon, Nigel Steed, Hugo Rowbotham, Robin Mayes, Bob Purshouse, Mike Gale, Graham George, Geoff Morley, Tony Jones, Mike Gallant, Martin Kavanagh, Graham Martin, Adrian Stephenson. During the LX Over 60s versus LX Over 65s match Adrian Stephenson and Bill Butcher were locking horns on the halfway line, when Tony Henman, who was standing nearby, was heard to say ‘Steady on chaps – there are limits’. Quite a rich comment coming from that particular source!